-General Manager Abraham Washington is standing mid-ring and welcomes everyone to the 50th FCW television show before the opening montage airs. Sheamus warns Angel that he'll smack the good looks off his face. After an exchange of wristlocks, Sheamus is sent to the floor following a dropkick from Angel. At the time of this match Sheamus was still on the ECW roster and had just finished his feud with Goldust. 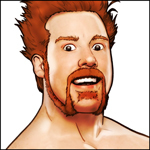 Sheamus grounds Angel for an extended period. Angel escapes a suplex attempt by hitting Sheamus with a knee. Angel with a springboard cross body for a nearfall. Angel with an enziguiri and mooonsault for another nearfall. Sheamus nails a bicycle kick for a nearfall of his own. Angel takes Sheamus down with a superkick and follows up with his 450 splash off the top for the big win. WINNER: Justin Angel in 8:21. A great showcase win for Angel on the 50th show. -A video package aired with highlights from the first 50 episodes of FCW. Included in the video were Batista, Ric Flair, John Cena, country music legend Charlie Daniels, Jack Swagger, Dolph Ziggler, Drew McIntyre, Abraham Washington, Tiffany, Alicia Fox, Rosa Mendes, Yoshi Tatsu, The Hart Dynasty, Sheamus, and most of the FCW regulars. Apparently this was a match booked by Washington as a result of Gabriel barging into his office and demanding a title shot a couple of weeks ago. Gabriel attempts a gut wrench suplex early on, but Riley grabs onto the second rope. Gabriel hits a few running forearm shots, but Riley counters with a sidewalk slam. Out of nowhere, Gabriel hits a variation of the Rude Awakening to obtain the victory. WINNER: Gabriel in 3:13. Gabriel seems to be performing with some added passion since his gimmick change. Riley's stock must be plummeting. -After the match, ring announcer Rosa Mendes interviewed Gabriel. He said he was one step closer to proving that anything was possible. Gabriel said his ultimate focus was on the FCW Heavyweight Title. Riley dove through the ropes and blindsided Gabriel until a group of referees were able to stop him. Before the match, Escobar explained his actions last week. Escobar said he built FCW from the ground and accused the fans of tossing him aside like a dirty rag doll. He said the fans and Banderas were out of line. Banderas shines early with a variety of dropkicks. Escobar takes control after some brawling and a neckbreaker. A horrible exchange took place in mid-ring where they each visibly missed chops and kicks. Banderas connects with a running step-up enziguri in the corner, but Escobar was able to grab the ropes to break a pinfall. Banderas climbs to the top and leaps off with a flying crossbody. Escobar rolls through the move and grabs the tights for the cheap win. WINNER: Eric Escobar in 3:27. A train wreck of two different styles. Banderas is better suited working with smaller opponents who can adapt to his lucha style (like Croft last week). The winner of this match will become the #1 contender to Angela's Queen of FCW title. By title, I mean just the right to call yourself Queen since no belt actually exists. When explaining the rules Rosa Mendes broke down and screamed that the title should be hers, but then composed herself enough to introduce the competitors. Thankfully, Tiffany didn't cut a promo before the match. Tiffany takes out Serena & Alicia with a double clothesline. Alicia does a wild bump through the ropes to the outside. Serena surprises Alicia with a nasty clothesline of her own. April leaps off the top rope and takes out Alicia & Serena on the floor. Back in the ring, Alicia misses a spin kick and Tiffany tosses her to the floor. April boots Tiffany in the face and sends her outside as well. Serena hoists April up in a torture rack position, makes April's head almost touch her feet (think Awesome Kong & Christy Hemme), and then dropped her to the mat for the pin. WINNER: Serena Mancini in 3:00. Much better than it had any right to be. Serena & April looked very good here. Slater attempts to run away from both opponents, but eventually gets caught and punished for his efforts. Reks takes out Hennig & Slater at ringside with a plancha as we head to break less than two minutes into the match. Slater, still wearing the cast on his arm, works over Hennig with a headlock. Hennig channels his father and connects with a running dropkick and a rolling neck snap onto Slater. The fans begin a dueling "Lets go Joe/Let's go T-Reks" chant. Reks hits Slater with the High Tide elbow drop for a nearfall. Reks crashes and burns on a moonsault attempt. Hennig quickly runs over and catches Slater in the Perfectplex for a nearfall. In an innovative spot, Slater takes out both men with a dropkick/clothesline combination. Reks executes his Burning Hammer finisher, but Hennig is able to get the shoulder up. Reks scores with a springboard dropkick to both men. Reks tries to pin them individually, but both are able to kick out. Hennig & Reks struggle with one another on the second rope. Reks punches Hennig and sends him tumbling to the floor. Slater runs up from behind and hits Sweetness off the second rope to obtain the title. WINNER: Heath Slater in 8:00 of what aired to capture the FCW Heavyweight Championship. Great showing by all three men. -A repeat airing of the video package highlighting the first 50 episodes closed the show.